The Cotton Floozy: Movie, Quote! This really is the post that made me decide to stalk you.. er.. Follow your blog. 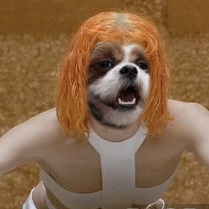 Now when the man makes me watch The Fifth Element for the 910597105170th time, I'll picture Leeloo with a puppyface! I'm glad that it is a mutual stalking thing, then, because I just purchased your 'Death's Minions: Be Weird.' SO EXCITED OMG. I think it might be more than weird that we share the same brain, yes? How did I miss this? Where the hell did September go? I want that.